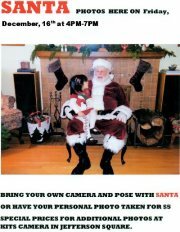 Santa Photos at NW Art and Frame Dec 16th! Friday, December 16th from 4 to 7 pm at NW Art & Frame, bring your camera and take a picture with Santa or get your personal photo with Santa for $5! Special prices for additional photos from Kits Camera in Jefferson Square.